I was sitting in my tenth job interview, the third one of the week, and the questions just kept coming. Don't get me wrong, the interviewer and I were clicking, and things seemed to be going very well, but I was just so tired of answering questions. Can this be the last question, please? As I drove out of the parking lot I was hopeful. Maybe this one will work out. Maybe this will be my new job. I really liked the people I met, and I really enjoyed the facility. The pay was subpar but I could make it work. When I arrived home, I began the waiting that we all experience after a job interview. I waited and waited. Then my phone rang. Holy cow, this is happening, I thought. I recognized the phone number from the previous call. But it wasn't a job offer. It wasn't an offer for a second interview. It wasn't even a human. It was a recording, or a robot. Ouch, I'm not even worth a real person picking up the phone to call me. I silently rolled my eyes at the thought of reapplying to a job that didn't even bother to send their condolences by way of human vocal cords. What now? For two and a half seconds I contemplated joining a circus, but I don't think that would work out either (I can only juggle one ball, badly. It's more of a rough toss from one hand to the other). No one told me this was going to be so cut-throat competitive. "There are tons of jobs open," everyone said. And there were. But there were also tons of people applying to those jobs. I'm not cut out for this. I graduated four months ago; most of my classmates had jobs. It wasn't supposed to happen like this. Why was I struggling? I spent my days at home scouring the internet for new job posts. I looked at different cities, and I priced apartments. 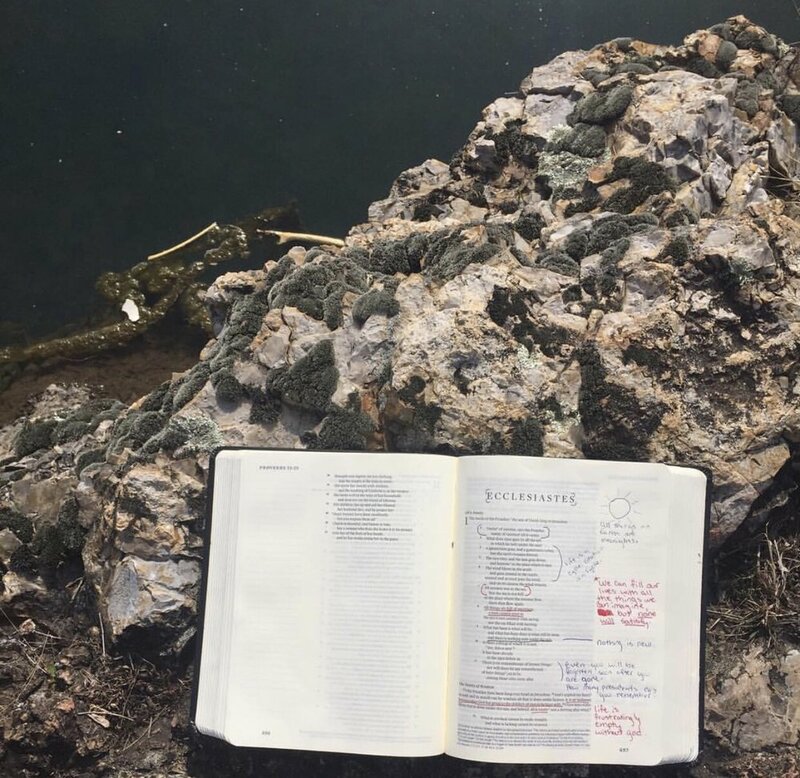 The most exciting part of my week was when I went hiking to a row of cliffs where I spent time reading my Bible, or when I drove my grandma to her Physical Therapy appointments. If an activity was more than 15 miles away, I politely declined for fear of using too much gas out of my car. I had savings, but I had to conserve money because I wasn't sure how long I would be jobless, and I didn't have a part time job because my last one ended on December 26th with the Christmas season. I continued applying to jobs as they came available, limiting my options based on how much money I had left to go to interviews. If the distance was too far, I didn't apply. In the previous months I had received a couple offers, but none seemed viable. One was super far away and one didn't feel right. Maybe I should have just accepted one of those. I was doubting my knowledge and abilities, and that wasn't going to help anything. Although I was discouraged and frustrated, I had really been digging into the Word and praying about the whole situation. Time after time, day after day, I heard God say, "wait". As much as I would like to say that it didn't hurt, I couldn't. It hurt and it seemed unfair. I had never really experienced rejection like this and I didn't care for it at all. In the midst of the hurt and rejection, God called me to Him. He pulled me in closer as I ran to him looking for answers. And you know what? The hurt didn't go away. It never once went away. But in the moments that I spent with God on that cliff, a peace came over me. In the middle of the world's rejection God held my hand, all the while saying, "You're enough for me". God didn't take away the discomfort or rejection (even when I pleaded), but he sustained me through it. He told me to wait because (little did I know) better things were coming. Things I couldn't plan. Psalm 23:5 says, "You prepare a table for me in the presence of my enemies. You anoint my head with oil; my cup overflows." God prepares a table for us in the very presence of our enemies. Right in the MIDDLE of them. Picture sitting at a table, just you and Him. Raging around you are the problems and circumstances you're currently facing. They don't go away but they can't touch you as long as God is sitting there with you. As long as you are sitting there with God. Keep sitting there and rest in his presence. In the jobless months following graduation, I experienced a lot of rejection. But with the struggle came breakthrough. God taught me so much, and I experienced things I never would have been able to if my situation was different. I was able to spend months fellowshipping and hanging out with my grandma, getting to know her, growing a deeper appreciation and love for her. How many people get that opportunity? I was able to help a friend in need: true, deep need. I spent extended time with God, learning and growing with Him. I'm so thankful for the struggle of those days, and I wouldn't exchange them for anything.